I speak to many aspiring pilots who are struggling to decide between learning paragliding or paramotoring. The two sports may look very similar, but they actually differ in more ways than first meets the eye. Although they are both very fun, they both carry certain risks that all new pilots need to be aware of. But which one is the safest, and why? That's what we will be finding out in Paragliding VS Paramotoring safety. When new pilots learn to paraglide they will be taken to the top of a hill in calm conditions for their first solo flight. They'll launch from the top and and slowly glide down to the bottom, hence the name top to bottom flights. These initial flights are taken in very low wind with no thermal activity to ensure the safest flight possible. Unfortunately the calm conditions that we take our initial flights in will be no good for any pilot that wishes to stay aloft. In order to stay in the air a paraglider will need either wind to create lift, or strong thermals to push the paraglider upwards. Pilots will search for smooth laminar air at the launch site and most will fly while there is thermal activity. This ensures the pilot will achieve a good lengthy flight time, something paragliding pilots crave. When new pilots learn to paramotor, their initial flights will also be taken in calm conditions. They can launch from a flat field or a hilltop as with paragliding. 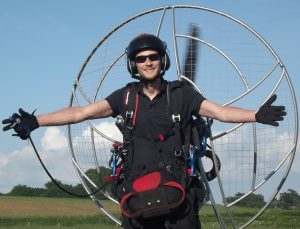 A paramotor is never dependant on wind or thermals because of the thrust from the engine pushing it along. Launching will always be easier with wind, but it's not essential, nor is it required to stay aloft. Pilots will usually fly early mornings before any thermal activity, or late evenings after the thermals die off. Flying mid day during strong thermals is never recommended because of the risk it poses to pilots. As we previously mentioned a paraglider needs strong wind or thermals to stay aloft, unfortunately both of these carry risks. We found out in my wing collapse article that strong wind poses a risk because of turbulence at low altitudes. For example, launching and flying downwind of any obstacle will cause dangerous turbulence known as rotor. This turbulence can easily cause a wing deflation called a wing collapse, if this happens at low altitude it's lethal. I witnessed this for the first time during my paramotor training back in 2013. The experienced pilot was ridge soaring, and only about 30 feet above the ground when the wing suddenly collapsed. It recovered quickly at about 15 feet but quickly collapsed again dumping the pilot onto the ground. Luckily he escaped with only a twisted ankle, but this is how many pilots have lost their lives. Something else that can collapse a paraglider is flying in thermals, fortunately pilots can learn to recover their wing quickly. This is great with enough height, but problems still arise when a collapse happens close to the ground. Even the most experienced of pilots are falling victim to low altitude collapses with no chance of recovery. Another danger that paragliding pilots face is themselves! Their keenness and yearning to fly can cause bad pre flight decision making. Some pilots travel many miles to their closest launch site only to find that the conditions aren't perfect. Not wanting to leave and return home without a flight they'll launch regardless, putting themselves in serious danger. If a paramotor is launched in turbulence or thermic conditions, pilots take the same risks as paragliding pilots. Although the constant forward motion that the engine provides along with the extra wing loading will make the wing slightly less prone to collapse. Another danger that faces paramotorists is the propeller that spins just inches from the pilot. If the throttle gets jammed open before the pilot is strapped in there is a big risk of impact with the propeller. Read all about this and discover how to prevent this very common accident > HERE. Or find out which paramotor uses a unique device to prevent these injuries occurring > HERE. There's also a risk of the brake handles getting sucked into the propeller and spinning the paramotor out of control. And the risk of the throttle cable hitting the propeller. Read more about this in my separate article where we find out whether paramotoring is really as safe as they say > HERE. Paragliding VS Paramotoring safety: Which one is safer? The thing that makes both of these sports safer is the pilots ability to make good decisions. That includes choosing a good launch site free from turbulence and obstacles, and good judgement of weather conditions. But with good training paramotoring is still considered much safer than paragliding for many reasons. 1. As we've already mentioned, paramotors can be launched in zero wind with no thermal activity. During training paramotorists are warned against flying in conditions that paragliding pilots long for, strong wind, or mid day thermals. Pilots will tend to launch on calm mornings before any thermal activity, or in the evening after the thermals die off. 2. Paramotorists have that same urge to fly as paragliding pilots, but low wind is much easier to predict than the perfect paragliding conditions. This means that paramotorists rarely end up 'parawaiting' in a field (waiting for the wind to drop). But parawaiting is a common sight at paragliding hills, and unfortunately some pilots will always launch before conditions become perfect. This is the reason that you will see experienced paragliding pilots landing in trees, on cars, and taking wing collapses at 30 feet on a daily basis. 3. As I mentioned earlier paramotors have constant forward motion, and a higher wing loading which helps keep the wing inflated. If a paraglider becomes parked (sat still mid air because of strong wind), there is a high risk of collapse. If the wind suddenly drops there is no forward motion to keep the wing inflated, so it collapses. This was the reason for the collapse I mentioned earlier that I witnessed during training. I also witnessed a big paraglider collapse during the first UK Parafest event in 2015, as a pilot flew into rotor in strong wind. The pilot came crashing down from about 30 feet, landing on top of a tent. About 2 minutes later a paramotor flew down the exact same flight path. It certainly looked a bit wobbly, but the wing remained solid throughout, and the pilot landed safely. 4. Engines give paramotorists the ability to climb to a safe altitude within seconds, even in zero wind. This places them above many dangers like rotor, and the extra height also gives pilots longer to react to any dangers. It also gives pilots more time to spot out landing options in the event of an engine failure. Paragliding pilots often ridge soar using the lift that comes from strong wind to stay airborne. This is very often done no higher than 200 feet, and as low as they like. You very often see pilots skimming the hillside as they struggle to gain altitude. A drop in the wind with no altitude can lead to landings in undesirable spots, and wing collapses lead to many pilots being killed. Paragliding VS Paramotoring safety: Can paragliding be made safer? Again, the pilots pre flight decision making plays a big part here. Pilots very often see low air time flights as a wasted journey to the hill. This is when they start to push their luck and fly outside of the paragliders limits. And sometimes (allot of times) the itch to fly overcomes true abilities and safety. To make paragliding safer pilots need to accept that they may have to go home without flying some days. If there is any doubt whatsoever the pilot should not launch. Pilots also need to understand what is going on with the weather up high. They should check multiple forecasts, winds aloft, thermal predictions, etc. And if they plan on long flights they should understand what might happen in the next few hours after launch. 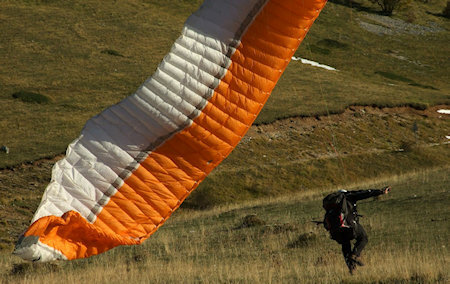 Paragliding VS Paramotoring safety: Can paramotoring be made safer? If the paramotor is launched in calm conditions paramotoring is much safer than driving your car to the field. The chance of a wing collapse on a calm morning or evening is very low. Whilst flying the main danger will be other aircraft. Pilots should always be aware of their surroundings, maintain plenty of height, and never get complacent. They should also expect an engine failure at any moment. So always have a landing option, avoid flying low over water, trees, or unknown areas where power lines are present. Paramotors and paragliders can be difficult for other pilots to see. So pilots can make themselves more visible to other aircraft by fitting an anti collision light to their cages or helmets. Read about why we're so difficult to spot and find out the best anti collision lights HERE. To avoid accidents involving the propeller, engines should always be started after strapping into the harness. All other paramotoring safety issues are addressed HERE. So we've looked at the main dangers of both sports and come to the conclusion that paramotoring is safer. But this is only because of the conditions that they are able to fly in. If a paramotor pilot launches in stronger conditions they can expect the same dangers as paragliding. 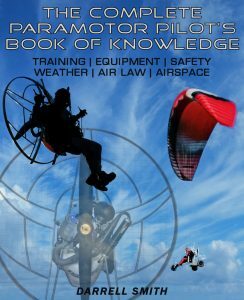 If you choose to learn paramotoring because of this conclusion there's one thing you should remember.. The safety of the sport is ultimately up to you, the pilot. Good decisions make safer flights, remember that and get it right every time. Overcome your fear of flying and paramotoring > HERE. Find out what the difference is between paragliding and paramotoring so you can decide which one to pursue > HERE. Discover what paramotoring is really like from long time pilots point of view > HERE. Find out exactly how much paramotoring will cost to learn and the running costs for a whole year > HERE. Check out my review of the paramotor and engine that I'm currently flying, the Parajet V3 Moster > HERE. I’m looking forward to learn paramotoring soon, and a couple of paraglider pilots told me I’d better do a paragliding course first, as it would make it easier to learn paramotoring… thanks to the wing management I would learn. Obviously that would also represent an extra cost to be added to the paramotor course…is it really worth? Hi Fabrizio, thanks for checking out the site! Taking a paragliding course as well as a paramotoring course really isn’t necessary in my opinion. If you do your research and find a quality paramotoring school, you will spend plenty of time learning how to ground handle the wing. During my course I spent 2 days in the field doing nothing but ground handling, this is long enough to teach you all you need to know. Although a few days of training won’t be long enough to become an expert in wing management, you can continue honing your ground handling skills outside of training in your own time, and at no extra cost. One benefit to taking a paragliding course would be the opportunity to perfect your takeoffs and landings with no risk to equipment. Fortunately for me, my paramotoring school had a paragliding hill, so I got to do top to bottom flights, and a little paragliding, and I think this is far better than being thrown in at the deep end, and having to take your first flight with a powerful motor and lots of extra weight to deal with. All of the best schools will have a hill where you can do some paragliding before adding the engine. If you can find a school that offers this option you will learn certain things much quicker. I never had a problem with landing like so many pilots do, and I think the few top to bottoms that I did definitely gave me an advantage. I hope this helps, good luck with your decision.